Our Classic Fit Joggers deliver a straight-leg fit with super-soft touch fabric for essential comfort, in and out of the gym. The timeless design also features an elasticated waistband and hem zips for the ultimate laid-back feel. They’re a must-have for any gym bag. I like it.It very soft and confortabe.Thank you for good item. I wear Medium, 100% of the time, and things somehow almost always fit me fine. Those joggers are too short, plain and simple. A shame, because they are super soft and well made. It's too much of a hassle to return them, so they went to the girlfriend, who is very happy. She is 176cm I think, and the length for her is perfect. They are a bit baggy for her, obviously (she's less than 55kg), but to hang out at home in winter, they are very nice. Myprotein people, please make them in more standard length! These are nice joggers but sadly too short. I'm 6'2" and they needed to be at least 3 inches longer, I ordered size small. Customer services were very helpful in finding out the lengths for other sizes, which were also too short. 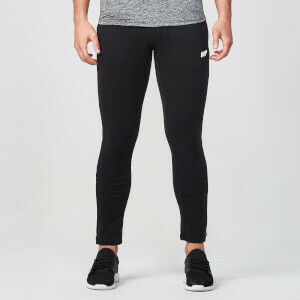 I use these joggers for running, weight training and for martial arts. They are comfortable and soft. Even after multiple washes, these joggers stay soft and have not shrunken or shown any signs of wear. The pockets are very large and have zippers that keep things from flying out while running. I am in the process of buying my second pair.